My brother needed a ride to work yesterday because, apparently, not all businesses close for snow storms like school do. Lame. So, since I was free from the bounds of my snowy school workplace, I offered him my services as a temporary chauffeur. You see, he doesn't have his driver's license yet and the local bus system was haywire after the surprise snowfall, leaving him completely in the lurch. Plus, I figured I could use the good karma. You just never know when that's going to come in handy, right? After dropping him off in the chaotic parking lot of his new place of work (a famed Chicago restaurant chain), I resisted the urge to grab myself a diabetes-inducing chocolate cake shake for the road. However, my route home took me right past my LCS - that was a bit of temptation that I did NOT have the mental fortitude to ignore. It was a quick in and out stop - I had to get home and whip up some chili for dinner. 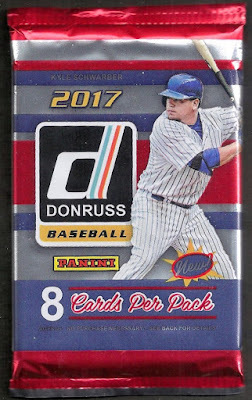 Thus, after a couple minutes, I grabbed myself a pack of the latest product to hit the shelves - 2017 Donruss - and headed back for the homestead. A little something to rip to scratch that ever-present itch; I figured I might as get a sampling of Panini's latest throwback, unlicensed product. 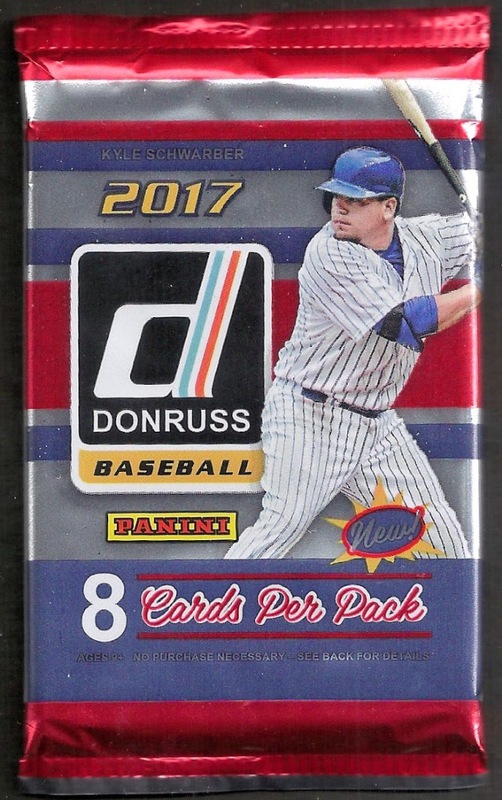 Apparently, the Cubs are cornering the market on pack "cover boys" in 2017 - Topps Series One had Kris Bryant and Donruss has claimed World Series folk hero, Kyle Scwarber. A Cub on the front of the pack is always a good omen, at least to this Cubs collector. 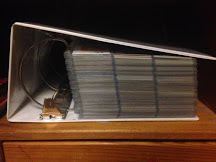 Also, who knows, maybe a little bit of that good karma I earned for helping my brother out of his predicament would show up in this pack of eight baseball cards? 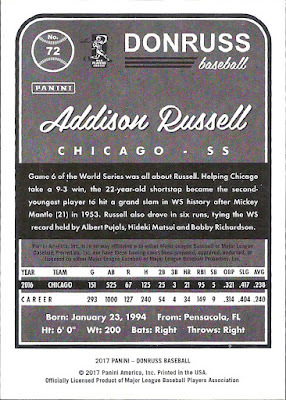 A Cubs card is always a welcome sight, especially one of post season-hero, Addison "Muscle" Russell. 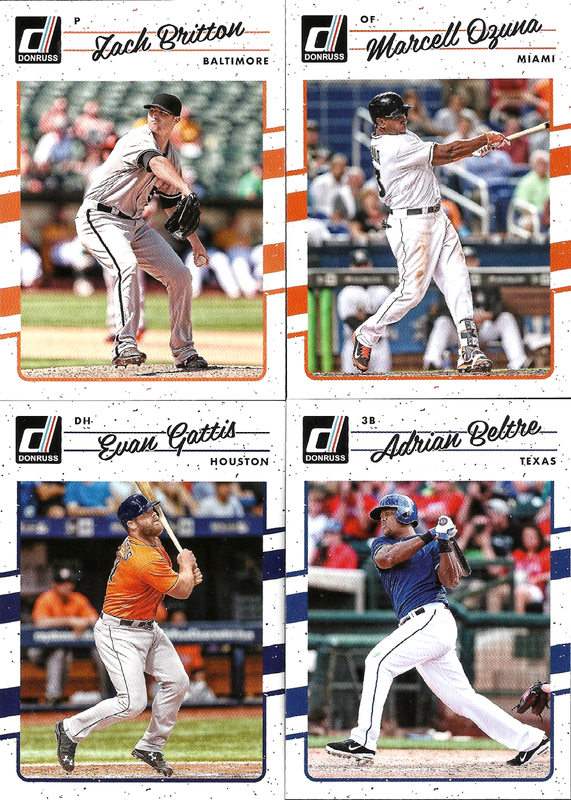 This is now the third year of the rebooted Donruss brand and this design stands out much more than the other two. It clearly borrows the layout and name bar portion from the ubiquitous, junk wax classic that is 1990 Donruss, with some slight adjustments. The team color coordinated slashes running through the middle are new design elements. Plus, using white, instead of red, for the border really allows the picture to pop and, I have to say, I like this design much more than I do the source material. As for the backs though, while I do appreciate the retro-stylings, I do not appreciate how much space the branding, logos and trademarks take up at the top. This leads to the rest of the card looking "crunched" and tough to read. Pluses and minuses - you can't win 'em all. Some significant players here, including the infamously under-utilized Zach Britton and future Hall of Famer Adrian Beltre. 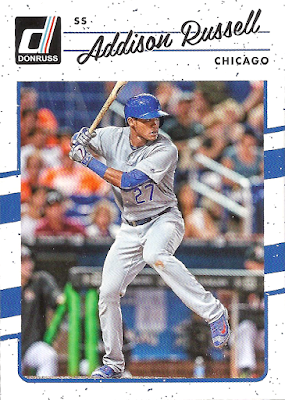 As far as photo selection goes, Panini appears to be doing a better job at selecting pictures that require minimal Photoshopping and hiding of logos. Otherwise, I don't have too much else to say. How about some inserts, then? Aces Cole Hamels and Johnny Cueto make appearances on the 1983 Donruss design, which has been aped excellently. The only difference, of course, being the script that reads city names instead of trademarked, team names. 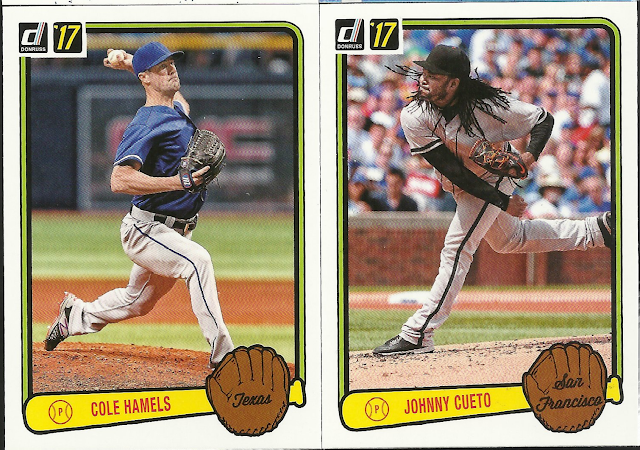 Well, that and I don't think any pitchers had dreads flying around wildly then, like Mr. Cueto. The only way that these could look more like their old school counterparts is if they were printed on vintage card stock. Woot! An autograph! 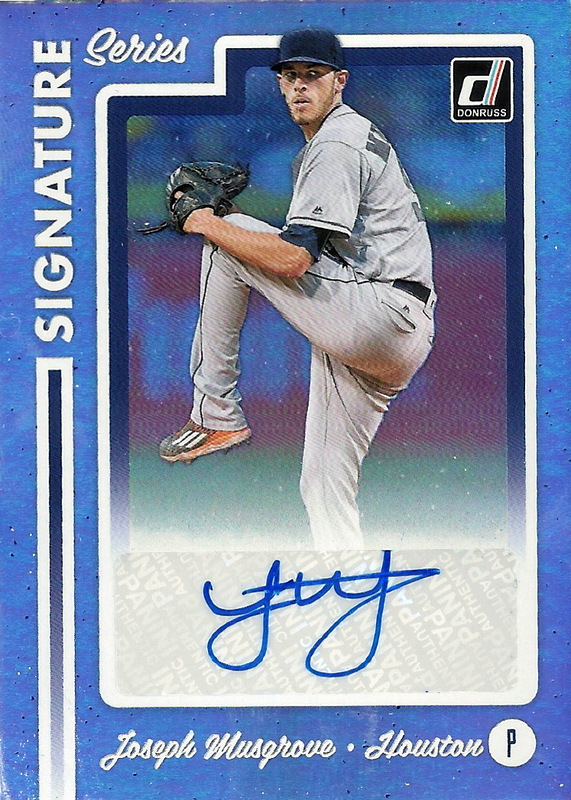 This Signature Series autograph might be a sticker of a player that I've never heard of, but pulling a hit from a random pack purchase is rare for me and always a rush. 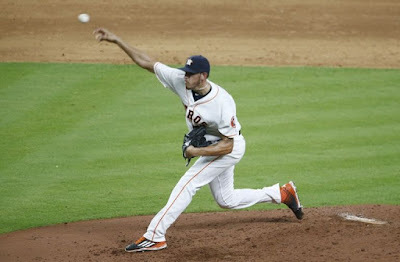 Joseph Musgrove was a first round pick of the Blue Jays back in 2011 and was traded to the Astros in a massive nine-player swap the next year. The pitcher was ranked as the 32nd best prospect in the game by Baseball America last year, on the strength of his finesse and control, and made his MLB debut that summer. The 24-year old hurler posted a 4-4 record with a 4.06 ERA in ten starts and a relief appearance, along the way. Here's hoping Joe claims a full-time spot in the Houston rotation this season and continues to develop, so that I can retire on this hit. That last sentence may have contained traces of sarcasm. If anyone would like to lay claim to the cards seen above, including the Musgrove, please feel free to let me know in the comments section below. While it was a thrill to pull the autograph, unfortunately it does not really have a place in my collection - I'd much rather forward the shiny John Hancock to someone who would truly appreciate it. To sum it all up, in my random, impulse-buy pack, I ended up with a new Cubs card for my collection, some trade bait, and an autograph, something which I rarely pull myself. I'll take that any day of the week. I guess that good karma that I earned from helping out my little brother was fast-acting! Perhaps I should shuttle him around more often. You're a mensch. I don't think I'll ever buy a pack of unlicensed cards. Personal taste. 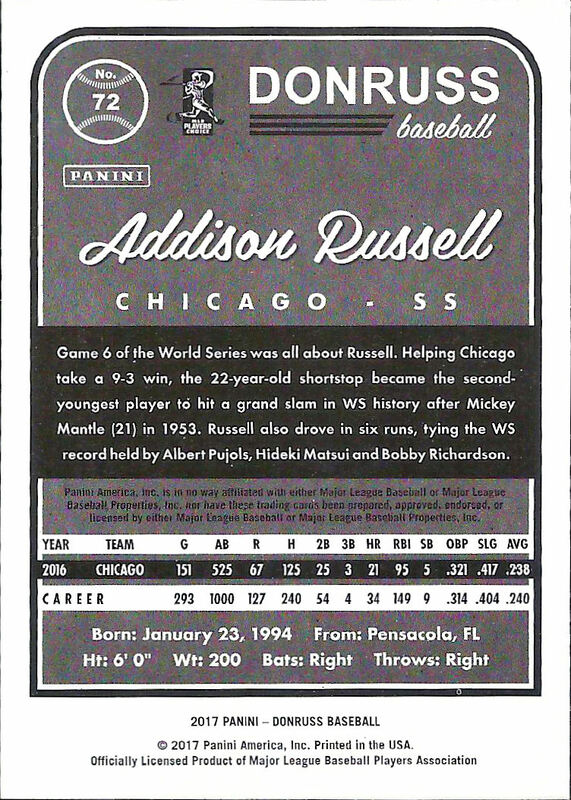 I'm not a fan of unlicensed cards... nor do I like the 1989 Donruss design. But for some weird reason, I find myself semi-attracted to 2017 Donruss. I'd pick up a box if the price was right.